The introduction of these new products is a result of dedicated research and market know-how. We know when served along with any chutney or preserve, the taste of the edible elevates to a new level. In fact, there are many who adore consuming bread dipped directly in chutneys and preserves. They are also served along with curries, fried snacks, with other edibles such as roasted poultry, meat, sandwiches, burgers, etc. In broad terms, a chutney is a relish originated in India. It is usually a blend of fruit, spices and herbs made to pamper the taste buds of chutney admirers. Interestingly, earlier chutneys were intended to be eaten soon after their production. However, with advancement in technology and innovative packaging, the shelf life of modern chutneys increased to a large extent. Preserves, on the other hand, are made by cooking the fruits with sugar until the mixture thickens. Also, the medium to large chunks of fruits are left in preserves. They are then either canned or sealed for long-term storage. In many parts of the world, preserves are also prominent as fruit spreads and even fruit butter. Shimla Hills always strives for the upliftment and betterment of the society. 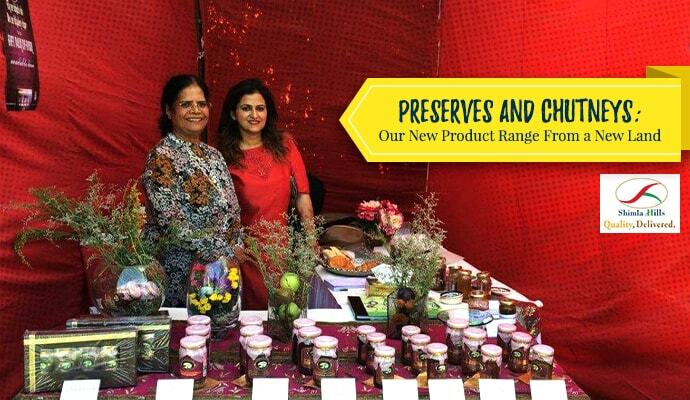 In its same endeavor, it took an initiative of promoting the self-help groups of Himachal Pradesh by procuring from them innovative products like apple chutneys with naga chilli (also known as world’s hottest chilli), Kiwi – Star Anise chutney, Apricot preserve, Plum Preserve, etc. Eager to get your hands on premium quality preserves and chutneys from the snow-laden province of Himachal Pradesh? Book your order today with the trusted name of the agro-products industry, Shimla Hills.